December 20, 2011 - A Florida man was sentenced to five years in federal prison for conspiracy to possess with intent to distribute marijuana, following an investigation by U.S. Immigration and Customs Enforcement's (ICE) Homeland Security Investigations (HSI) the Drug Enforcement Administration and the Lake County, Florida, Sheriff's Office. 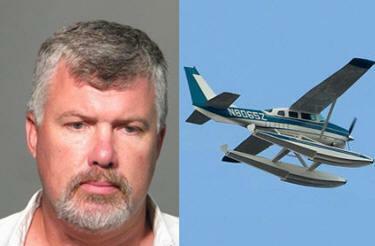 Randall C. Starcher, 44, of Kissimmee, Florida, was also ordered to forfeit the Cessna 206 airplane that was used to transport the marijuana and which was traceable to proceeds of the offense. Starcher, a licensed pilot, pleaded guilty on October 3. According to court records, he was paid to fly loads of marijuana from Texas to central Florida. On or about May 23, 2009, he and another co-conspirator purchased a Cessna 206 private plane (Tail No. N8065Z) with approximately $68,000 in cash. The co-conspirator and Starcher agreed that Starcher would pay off the purchase price of the plane by piloting it on flights to and from Texas. In 2009 and 2010, Starcher piloted the Cessna 206 at least 10 times on round-trip flights between central Florida and Texas. He purchased fuel for these flights at the departure airport in south Texas and at multiple fuel stops along the way. He always paid for the fuel with cash provided by his co-conspirators. There were approximately 500 pounds of marijuana on board the aircraft for each flight from Texas to central Florida. The Cessna 206 known variously as the Super Skywagon are used in general and commercial aviation. The Cessna 206 was originally developed from the popular retractable-gear Cessna 210. The line's combination of a powerful engine, rugged construction and a large cabin has made these aircraft popular bush planes. Cessna describes the 206 as "the sport-utility vehicle of the air." These airplanes are also used for aerial photography, skydiving and other utility purposes. They can also be equipped with floats, amphibious floats and skis. Alternatively, they can be fitted with luxury appointments for use as a personal air transport.